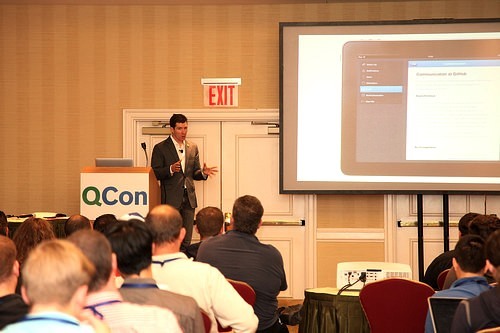 The third annual QCon New York brought together over 500 team leads, architects, project managers, and engineering directors. 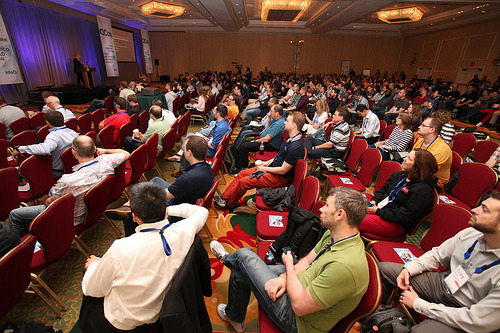 Over 100 practitioner-speakers presented 80 technical sessions and 14 in-depth tutorials over the course of five days, providing deep insights into real-world architectures and state of the art software development practices, from a practioner’s perspective. This year we introduced a discussion café at lunch with seating for 50 at 4 person tables. 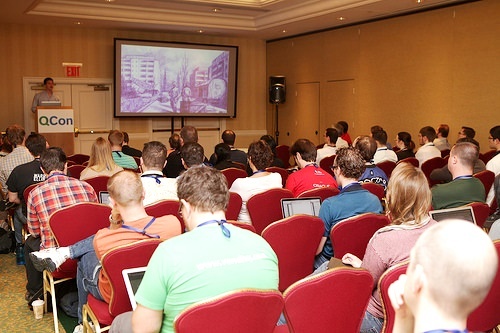 Topics included scalability, continuous delivery, and web + mobile UX. We also introduced a new HTML5 offline-capable conference guide for mobile devices, and a new social networking feature to help attendees connect better with each other and get updates from the conference. 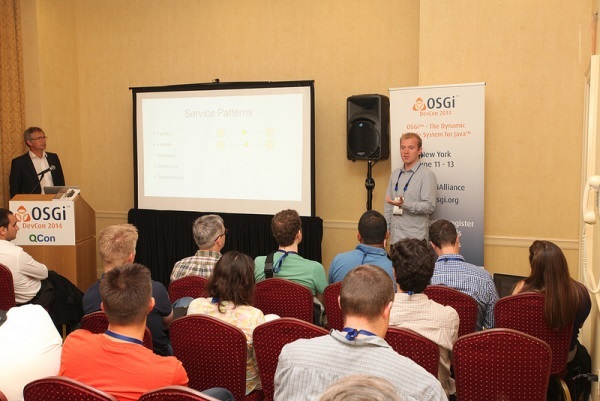 In addition, for the first time, we were co-located with OSGi DevCon 2014, the premiere North American OSGi event, with speakers including Peter Kriens, Tom De Wolf, Neil Bartlett and Tim Ward. 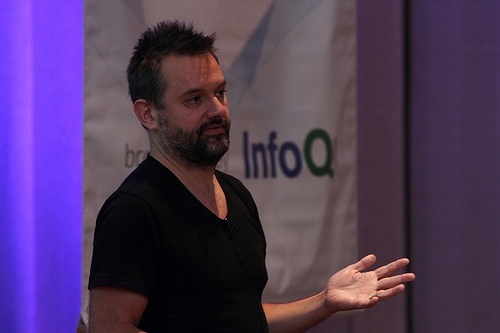 Videos of most presentations were available to attendees within 24 hours of them being filmed, and over the course of the coming months InfoQ will be publishing these sessions as well as 24 video interviews that were recorded by the InfoQ editorial team. You can see our publishing schedule here. 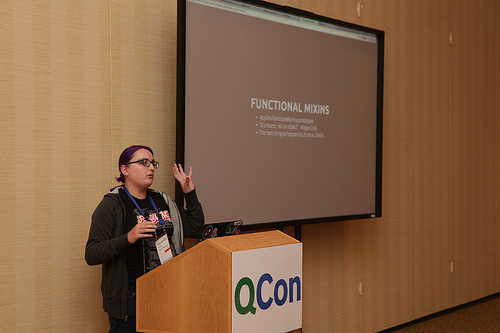 There are also numerous QCon photos on our Flickr page. Software is Dead; Long Live Software! split your model into ‘aggregates’, groups of ‘classes’ which logically belong together, and can be changed disjunctive of other aggregates. accept not all data changes have to be applied over your entire model IMMEDIATELY. Engage the business into discussing what parts of your model need to be updated ‘real-time’, and what parts can be updated in a later stage. again, don’t shy away from creating a new model, when your current model, although perfect for its current use, is not up for the job. it’s important to understand the relation between the different aggregates in your model, and what strategies to use on these relations (working together, just re-using the other model, translating between models or several other strategies). re-evaluate the strategy on relationships between your aggregates. It was also really nice to see that the presenter often made a side note in which he also addressed questions like how to sell and change culture and thinking. The primary tip being: make sure the most important impediment is transparent to every stakeholder and they understand the consequences for their expertise. Wait for momentum (which can take a while especially if your rather impatient) and show that it can be different. “The future of computing is describing WHAT we want to do, not HOW” referring to the difference between writing down code to loop over a collection versus only describing what we want from the collection. “With functional programming you write code, you come back two years later and it will run faster” making a key point to the fact of parallel and concurrent programming and that the computer itself will best know in which runtime conditions it’s in. There is no need for a garbage collection; this is garbage collection on steroids meaning that someone or something else manages the state and you don’t need to be bothered with it and only think about what you want. Now, knowing what engineers appreciate, it’s all about ‘telling the story’ about what unique opportunities exist at your company/project, and using the right ‘channels’ to share your story. @jessitron: Know your service. 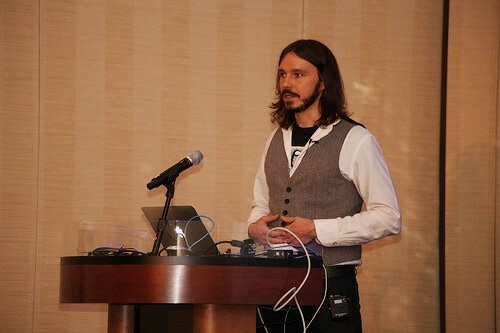 @dmarsh #qconnewyorkEvery Dev is responsible for testing impact of changes they make, and releasing responsibly. @jessitron: Free the People. Optimize the Tools. 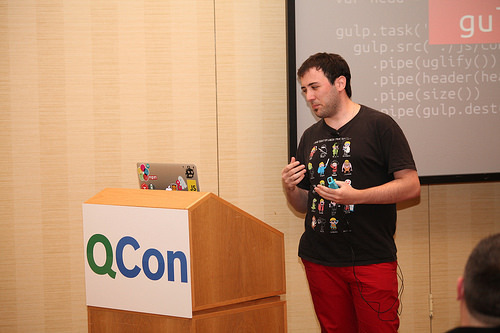 @dmarsh #qconnewyork Every dev deploys, and tools help them do this carefully and watchfully. Dianne Marsh, director of engineering at Netflix shared how Netflix ensures their engineers get the independence to innovate. Their basic vision is to let free of charge of the people and to improve the resources. They do that by having their professionals provide context fairly than management the men and women and consider to attract and keep talent. Clearly engineers have the tendency to go any which way they can, so professionals are intended to aid them to have some sort of alignment. Dianne Marsh's keynote and Adrian Cockroft's session about how services are implemented at Netflix emphasized developer responsibility through the whole lifecycle of the code. A developer's job ends when the code is retired from production. Dianne's mantra of "Know your service" puts the power to find a problem in the same hands that can fix it. Individual developers implement microservices, deploy them gradually to production, and monitor them. Developers understanding the business context of their work, and what it means to be successful. It'd be wonderful to have all the tech and business knowledge in one head. What stops us is: technical indigestion. Toooo much information! The Netflix solution to this is: great tooling. When a developer needs to deploy, it's their job to know what the possible problems are. It is the tool's job to know how to talk to AWS, how to find out what the status is of running deployments, how to reroute between old-version and new-version deployments. The tool gives all the pertinent information to the person deploying, and the person makes the decisions. Enhanced cognition, just like Engelbert always wanted (from @pwang's keynote). 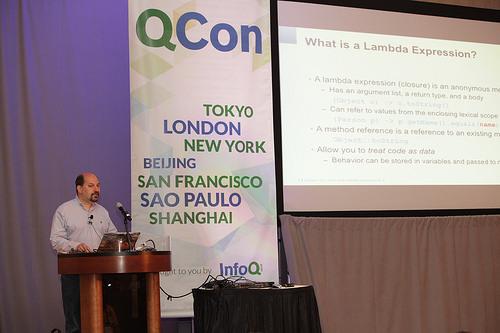 @adrianco: #qconnewyork @swami_79 @ksshams using formal methods based on a precise description of the design using TLA+, not reading the code. 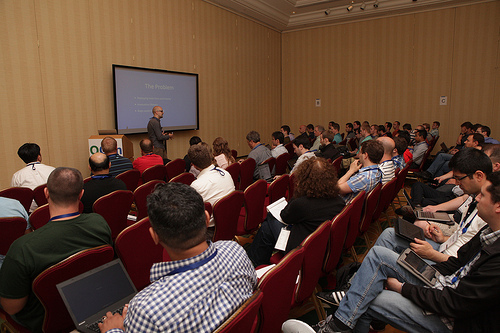 @adrianco: #qconnewyork @swami_79 @ksshams AWS SREs learn PlusCal to work on TLA+ in a few weeks. Not an esoteric research only tool. 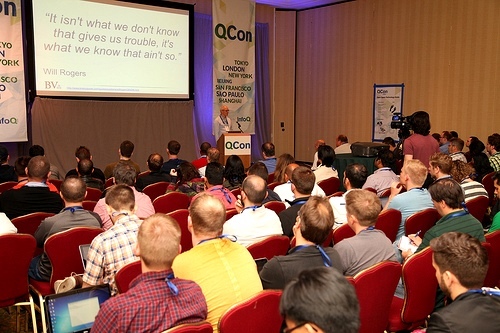 @adrianco: #qconnewyork @swami_79 @ksshams one in a trillion problems happen all the time at Amazon scale. They insisted on planning for both scalability as well as failure. The former is usually something that doesn't get immediate attention, but that's usually still more than what we do with the latter. … How many companies actually monitor performance day by day? In my experience dev teams only start addressing performance when there's an immediate issue. One interesting concept they introduced is the Blast Radius. During their failure testing they explicitly analyze how far that failure reaches into the application landscape. With that information, they've tried to tune the interfaces between components to become a bit more resilient. @jgrodziski: Building software = achieve state mutation over time in spite of complexity #qconnewyork from Peter Wang, great keynote btw! Peter Wang told us we've been sitting pretty on a stable machine architecture for a long time, and that party is over. The days of running only on x86 architecture are done. We can keep setting up our VMs and pretending, or we can pay attention to the myriad devices cropping up faster than people can build strong abstractions on top of them. The Stable Dependencies Principle is crumbling under us. Web applications may one day surpass desktop applications in function and usability -- if developers have more programming languages to choose from, according to a Google engineer. "You should have more choices of viable languages," said Gilad Bracha. 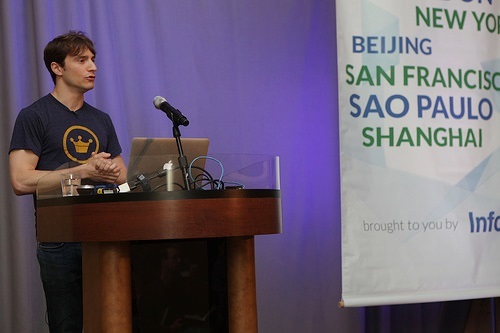 "I think the Web platform could make Web applications as good or better than native applications," Bracha said. "Ultimately it has to do that. Otherwise, the proprietary app stores will come and eat us all." Bracha also demonstrated Lively. Lively is even more responsive than Elm. The developer, when viewing a draft of their program in the browser, can simply click on any part of the application on the screen and Lively will bring up to the screen the specific object code that rendered the object…. Bracha showed off other responsive languages, Leisure and Newspeak, the latter of which Bracha created. 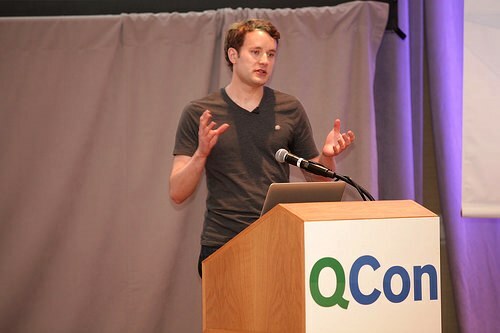 @charleshumble: Jeff Johnson from Facebook announces Apollo at #qconnewyork: distributed database for strong consistency at scale. @adrianco: #qconnewyork Facebook Apollo uses CP within a shard in a Datacenter and CRDTs to handle AP between datacenters as needed. Apollo itself is written in 100% C++11, also using thrift2. The design is based on having a hierarchy of shards. These form the basic building block of Apollo. Essentially like HDFS (regions) are the building block for HBase. It supports thousands of shards, scaling from 3 servers to ~10k servers. The shards use Paxos style quorum protocols (CP). Raft is used for consensus. Fun side note: this turned out to be not much simpler than multi-paxos, even though that was the expectation. RocksDB (a key-val store, log-structured storage) or MySQL can be used as underlying storage…. The apparent sweetspot for Apollo is online, low-latency storage of aforementioned data structures…. Every operation on the Apollo api is atomic…. Atomicity works across shards, at varying levels… The idea is that Apollo provides CP locally and AP between remote sites…. One of the current applications of Apollo at Facebook is as a reliable in-memory database. For this use case it is setup with a RAFT write-ahead-log on a Linux tmpfs. They replace memcache(d) with this setup, gaining transactional support in the caching layer. Currently, Apollo is developed internally at Facebook. 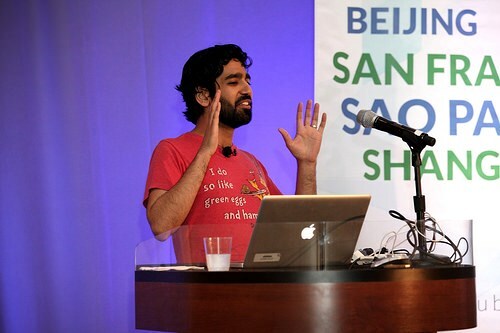 No firm claims were made during the talk that it will be opensourced. It was mentioned as a possibility after internal development settles down. Gilt, a US fashion outlet site, decided to break their monolithic website into about 50 micro-services each owned by a separate team. They used Docker to ease deployment of those services on shared Amazon VMs. According to the speaker they were very successful in that migration, but were now facing the more operational challenges of supporting so many dependent services. Apparently he has taken the same conclusion that tooling for supporting that, as well as continuous deployment, are becoming more important by the year. He concluded the talk with the advice that if you consider moving to micro-services, just start building every new feature as a micro-service and add the required tooling along the way. Dianne and Jez both used "Highly aligned, loosely coupled" to describe code and organization. 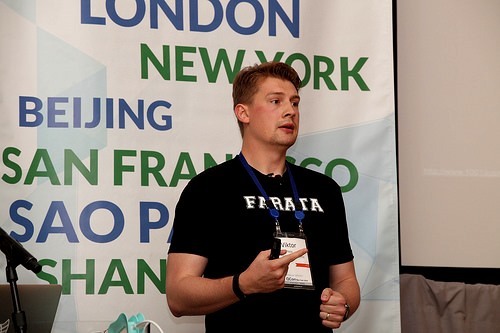 Edmund Jorgensen delivered a refreshingly fun session on the latency of teams and how bringing down latency is best thing an organization can do. So many managers are focusing on the short-term needs rather than understanding how expensive any form of latency is. Think of technical debt, manual deployment steps, or anything else that prevents a team for speeding up. His basic approach is that reducing latency creates information earlier and early information is worth a lot of money. In fact, it saves money, so why do managers still persist on spending all their capacity on building features rather than having a good balance between functionality and reducing latency? Traditional companies generally use a linear ladder where a software engineer can potentially climb to senior software, architect or even CTO. This provides a clear structure for promotion, and thus more salary and status. However, according to Chris this model can also be a factory to eject people due to limited management positions or by promoting people beyond their capabilities. In short, it provides simplicity for the manager, not the engineer. Alternatives exists. For instance, some companies use two ladders; one for management positions and one for software engineering positions. Although it provides a technological track, and it clearly sets up easy ways to recognize accomplishments, it still looks like a linear ladder. Similarly to the previous model it assumes that the only way to grow is to take more responsibility or control. It still doesn't answer how to experiment or switch between roles. Spotify believes that people that add value should be paid more money regardless of their role or position. To support that they stimulate engineers to try something new, which doesn't necessarily mean they stop what they are doing. In other words, they try to get them out of their comfort zone, to acquire a new skill and to push themselves in a new direction. More specifically, to shake things up a bit and see what talents or skills somebody really has. So instead of this rather rigid ladder, they've introduced add-ons that add both personal value as well as business value aligned with the skill-set and interests chosen by the engineer. In a sense it is engineer-driven but supported by company. The manager must work with the engineer to help him or her to find those challenges or even define a completely new add-on, or even giving them some time off to attend trainings, sessions or workshops. And those add-ons don't have to exist upfront. It is perfectly fine for an engineer to come up with another add-on that adds value to the company. Some the add-ons currently being tried at Spotify include a speaker, a road manager, coach, evangelist, mentor, trainer, writer or even open sourcer. Even an architect is treated as an add-on, simply because they help in alignment rather than to make decisions. If you ask me, this sounds like a great model. Another slot in this awesome conference with an open-space session on culture. This included a great discussion on mentoring and how important this is for your career. Several of the participants shared their opinions on how a junior engineer needs to be taught on how to get the most out of this skills and how to advertise him- or herself within an organization. Another discussion was about how to determine if somebody is going to match your organization's culture during an interview. Inviting somebody for lunch helps to see how somebody behaves in a new group was one suggestion. Having full-day interviews to allow the person to relax was another. However, one participant said they stopped doing that because candidates would be completely drained at the end of the day. Another participant told us that upon arrival of the candidate, they first asked about there private life, kids, etc. and then came back after 5 minutes or resulting in a much more relaxed interview. Doing code assignments from home is also very popular, but some mentioned they were worried the candidate would game that system. The final topic dealt with introvert colleagues. I explained how something like Flowdock seems to help those people that have great ideas, but just don't feel comfortable enough to share that in an open discussion. I already knew that GitHub employees can spend 20% of their time on innovations, learning new things, but I didn't know that on average 70% of the people work remotely. That explains the amount of energy they put on building tools and offices that support that. For instance, they've build an internal app that provides a central location for discussions, sharing ideas, their internal communications handbooks and having live video chats. They also organize mini-summits where two engineers can do an internal talk which is then shared through that same app. Even cooler, they build tools to allow them to listen to the same music all over the world. So if somebody makes a remark about a cool song at the other side of the world, it's almost as if they work at the same office. They also pro-actively build small offices with a living room or café-styled look as well at different places in the world to allow people to have a nice place to meet informally. Those offices also have some kind of phone booths to work in. In fact, to better understand how it is to live outside of the US and in a different time zone and to work on a global project, the CEO decided to move to Paris for a year or so. They also organize beer:30 meetings where teams have informal virtual meetings with other global teams. While discussing the communications guide, Matthew shared some of the foundational principles Github. First of all, teams make decisions about what they do, not committees of carefully selected people. Egos are not allowed in discussions. In the end, the best argument wins. That's an interesting statement, especially considering my own challenges to give somebody enough room to make their point sometimes. But even more striking is that everything is open within GitHub. The financial situations, salaries, expenses and even meetings that deal with the future and strategy of the company. This all starts by promising an interesting learning experience, both on the job as well as outside the job. For instance, new employees are also shown around in New York. What places they should visit. Where to find a nice place to stay. How to meet-up with new people. Next to that, they pick their mentors from the most experienced, pragmatic AND patient people that understand starting with clear milestones and then gradually moving to goals is the best. They know that fostering ownership and trust is essential, the room for self-exploration is required, while not overwhelming them with both information and too much freedom. Even more important (and something I often forget in my desire to help teams) is that failing is okay, as long as you learn from it. You should really create an environment that provides feedback, but take responsibility to protect them from anything that would de-motivate them to try new things in the future. At the same time, teach them how to fail by given them an assignment that is difficult or impossible to do. And don't forget to advertise them within your organization. Always introduce them to whoever you run into and openly praise them for any accomplishments. Daniel's closing statement was particularly interesting since he warned us not to underestimate a young new colleague. They might be much smarter than you are…. He showed us that a lot of the current successful startups were founded by prior Google developers. So why did they leave and became so successful? Well, according to his findings, using equity instead of salary as an incentive really gets people to innovate while most organizations have a rather traditional reward system. He also used a lot of fun facts from the world of the venture capitalists and how they never bet on a single horse. In fact, their entire investment strategy is based on the approach that one of the investments is going to be paying the losses made by the others. So he advices organizations to have multiple teams work on innovation at the same time. Or even better, let them leave the company, do their innovations autonomously and then buy them back, just like Google did. In higher-level architectures, microservices are all the rage. Unlike old-style legible architecture diagrams, the dependency diagram in microservices looks like the death star. Services connect directly to each other willy-nilly. There are alternative microstructure architectures that, like React.js, get the data flowing in one direction. Fred George describesputting all the messages on a bus ("the rapids") and let services spy on the messages relevant for them ("the river"). The only output a service has is more messages, delivered into the rapids for any other service to consume. @jessitron: There is no escaping decision making. 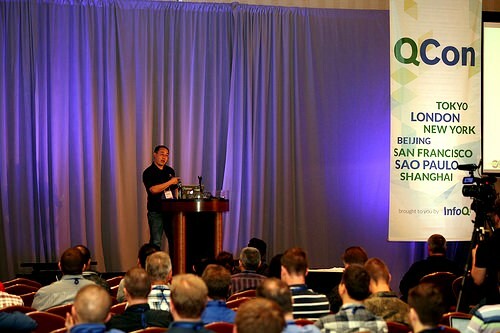 @mfeathers #qconnewyorkSupport the decision with information. Don't try to take it away. Michael Feathers is one particular of my hero speakers, not only because of his exceptional e-book, but also since most of his talks are truly inspiring. He has spoken about Conway’s Legislation numerous times, but this was the initial one exactly where he employed this legislation to propose organizational answers. About he said that irrespective of the greatness of your architecture and all the agile practices your making use of, faster or later you will operate into scaling problems caused by the organizational composition. I’ve been functioning at a client that grew from 8 to one hundred twenty men and women in about three years and Conway’s Legislation is truly seen there. It starts to get specific hard when you can not get all the developers on the very same flooring. That’s one of the factors Michael has a fantastic interest in the whole micro-companies hype. Given that every micro-services can be managed by at most 1 crew, it supplies not only architectural scalability but also on the organizational degree. 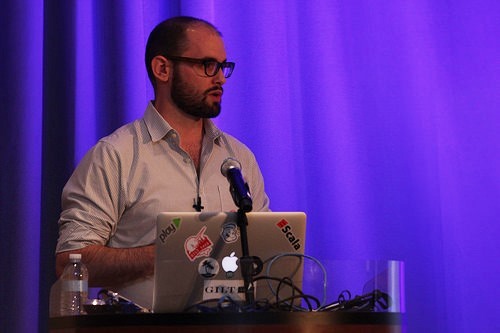 Connection between code and people was the subject of Michael Feathers' talk. Everyone knows Conway's Law: architecture mirrors the org chart. Or as he phrases it, communication costs drive structure in software. Why not turn it to our advantage? He proposed structuring the organization around the needs of the code. Balance maintaining an in-depth knowledge base of each application against getting new eyes on it. Boundaries in the code will always follow the communication boundaries of social structure, so divide teams where the code needs to divide, by organization and by room. Eric Evans also suggested using Conway's Law to maintain boundaries in the code. Both of these talks also emphasized the value of legacy code, and also the need for renewal: as the people turn over, so must the code. Otherwise that code+coder symbiosis breaks down. @jessitron: Escape from the Big Ball of Mud means creating boundaries. 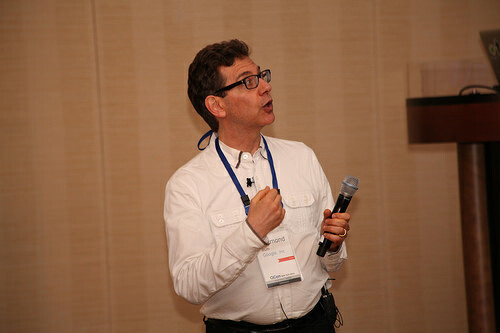 @ericevans0 #qconnewyorkHe suggests an Anti-Corruption Layer. In code and with people, successful relationships are all about establishing boundaries. At QCon it was a given that people are writing applications as groups of services, and probably running them in the cloud. A service forms a bounded context; each service has its internal model, as each person has a mental model of the world. Communications between services also have their own models. Groups of services may have a shared interstitial context, as people in the same culture have established protocols. (analogy mine) No one model covers all of communications in the system. This was the larger theme of Eric Evans' presentation: no one model, or mandate, or principle applies everywhere. The first question of any architecture direction is "When does this apply?" Right after admitting he wasn’t really sure what architecture genuinely is (! ), he talked on our failed tries to create strong and resilient methods. Which is why he thinks Netflix is performing these kinds of excellent tasks. They have in essence managed to reach perfection in dealing with imperfection. As a prolonged-term architect that will profoundly influence my future endeavors. Presented that I comprehended him appropriately, his standard rule-of-thumb is that inside a bounded context (BC) you ought to have 90% of the features lined by an elegant architecture. The remainder doesn’t have to be so excellent, as extended as the BC is aligned with the group structure. That assures that any shortcuts that are having are properly-identified inside of the crew and won’t shock other teams. By more decoupling the BCs from every single other using special interchange contexts that translate messages among BCs (aka the Anti-corruption Layer), and not sharing any sources this kind of as databases, you can localize the imperfections. Oh, and with that assertion of ‘not becoming so perfect’, he actually intended to use if-then-else constructs fairly than properly-created polymorphic abstractions! @jessitron: Complexity is in the eye of the beholder. 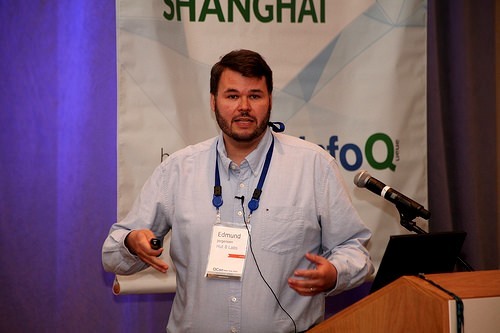 @TimothyWard #qconnewyorkIs #OSGi hard, or is it solving a hard problem that we'd rather ignore? 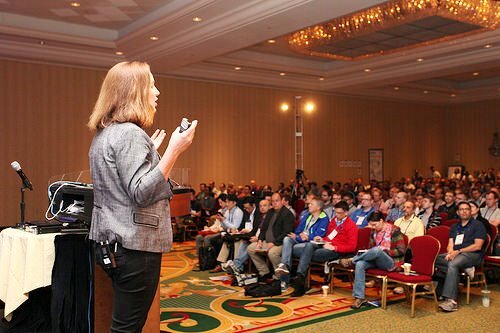 The main reason I attend this conference is to know the industry trend in the software and service development, learning more people use bigdata and machine learning techniques in there services and find existing Microsoft customer and understand their user cases. 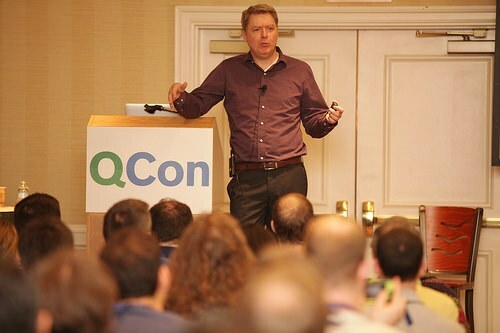 @jtdavies: Sat back in comfort on @VirginAtlantic, good bye New York, it was a great #QConNewYork. London and family here I come! 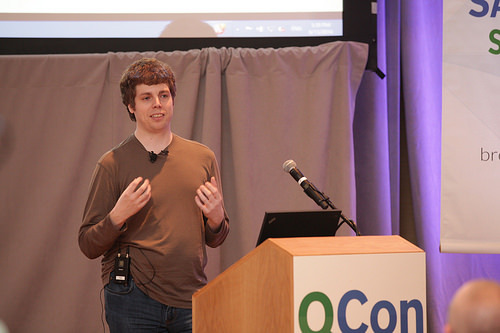 @JamesKLavin: Enjoyed #qconnewyork, esp. excellent talks by @netflix, @facebook and @continuumIO. They've got some talented engineers & managers. 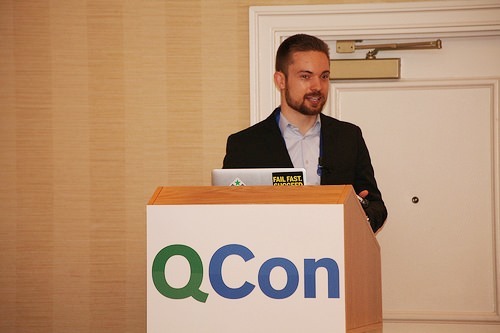 @paulwilliamhill: Really enjoyed presenting at @qconnewyork #QConNewYork an excellent conference filled with top minds. 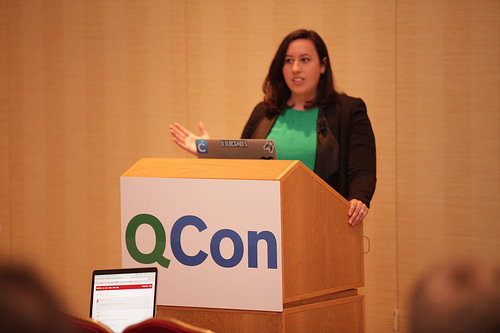 Overall, QCon New York emphasized: question what you're used to. Question what's under you, and question what people say you can't do. Face up to realities of distributed computing: consistency doesn't exist, and failure is ever present. We want to keep rolling through failure, not prevent it. We can do this by building tools that support careful decision making. If we each support our code, our code will support our work, and we can all improve. Application monitoring and NoSQL/other database techniques are dominating the booths, nearly all booths are related to one of the techniques, which is also a good indicator of what is hot in industry. 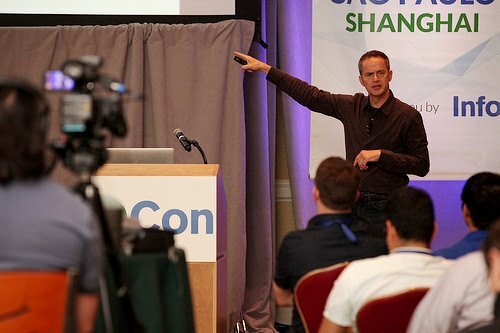 QCon's focus on practitioner-driven content is reflected in the fact that the program committee that selects the talks and speakers is itself comprised of technical practitioners from the software development community. 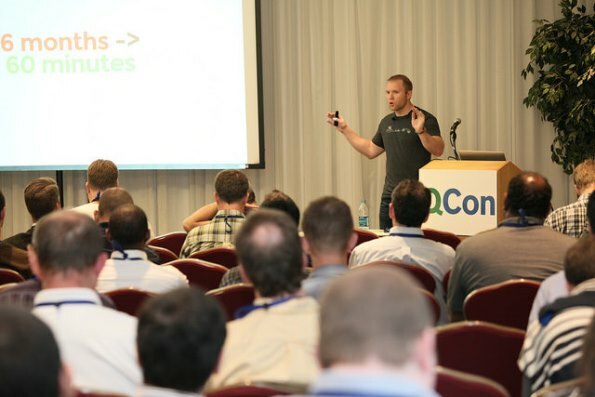 QCon New York was produced by InfoQ.com. We will next be in Rio de Janeiro September 23-25 and San Francisco November 3-7 this year. 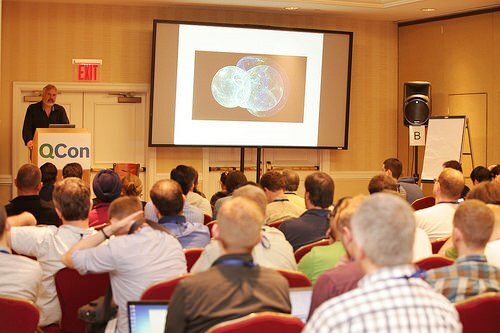 QCon New York will continue to run in New York around June of every year.